Edward and Amy Lewis both played an instrument role at Cardiff University Settlement. Edward was the settlement’s arithmetic tutor and summer camp worker. Amy was the leader of the Girls’ and the Lads’ Clubs. Edward was a Cardiff solicitor in his thirties and had moved to Splott when he married Amy (née Hughes) in 1913. It is likely that they met and fell in love at the settlement. Luker’s envelope shows that as a married couple, the Lewises chose to reside with their baby daughter Amelia not only in Splott, but at 2 University Place, a stone’s throw from Settlement Hall which backed onto this cul-de-sac. Luker, a working-class Splott lad, initially enlisted in the King’s Guards, but subsequently transferred to the Welsh Guard when it was formed at the end of February 1915. He would spend the rest of the war in this regiment, eventually winning a military medal. 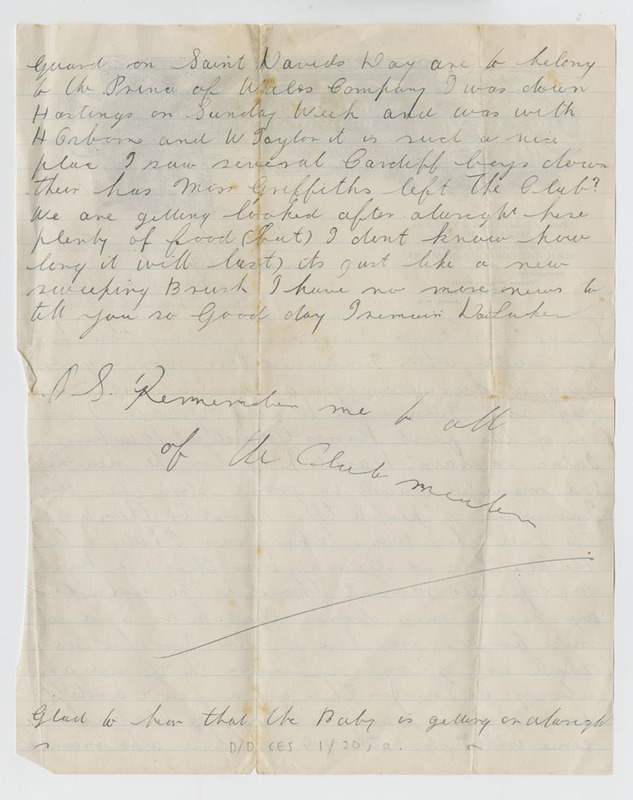 At the time Luker wrote the aforementioned letter to the Lewises, he had yet to experience active combat in France. 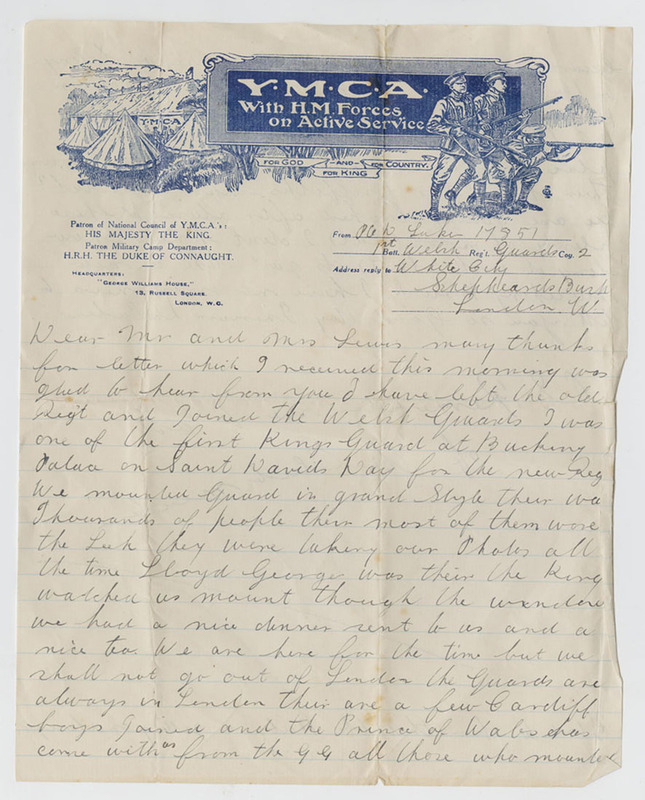 Earlier correspondence suggests that he was enjoying military life, boasting to the Lewises that his had won his swimming badge, was keeping himself clean, and that he was about to take his rifle certificate.3 In his March 1915 letter he reported to the Lewises that ‘We are getting looked after alright here[.] plenty of food (but) I don’t know how long it will last, its just like a new sweeping brush’. He also reported to the Lewises that he had recently returned back from a visit to Hastings with two fellow former Cardiff Settlement Lads’ Club members. their was Thousands of people their most of them wore the Leek they were taking our Photos all the time[.] Lloyd George was their the King watched us mount through the window[.] we had a nice dinner sent to us and a nice tea…all those who mounted guard on Saint David’s Day are to belong to the Prince of Wales Company. Lucinda Matthews-Jones is a lecturer based at Liverpool John Moores University. She is currently writing a book on the British university settlement movement. It was over the summer that she discovered and read letters sent from a group of Splott soldiers to Edwards and Amy Lewis. This post emerges from this research. Posted on February 27, 2015 by glamarchives. This entry was posted in Uncategorized and tagged Amy Lewis, Buckingham Palace, Cardiff, Cardiff University, Cardiff University Settlement, David Lloyd George, David Luker, Edward Lewis, First World War, Splott, St. David's Day, Welsh Guard. Bookmark the permalink.